Justin Gaethje Puts Edson Barboza To Sleep Via Brutal Punch!!! UFC on ESPN 2, which is happening live from inside Wells Fargo Center in Philadelphia, Pennsylvania tonight (Saturday, March 30, 2019), is headlined by a Lightweight division fight between two superb leg kickers, the former WSOF 155-pound king Justin “The Highlight” Gaethje and ex-Ring of Combat and Renaissance MMA champ Edson “Junior” Barboza. The third man inside the Octagon is Keith Peterson. Let the kicking spectacle begin! As expected, Justin Gaethje throws the first leg kick. Another one, and Barboza answers, this is a great match. Head kick, and now uppercut and right hand hurt Barboza. Edson is in big trouble now. Gaethje continues to pursue Edson, eats a big punch to the head, but continues pressing the Brazilian. Short right hand Gaethje, followed by a right hand, the fighters separate. Great hook Gaethje, now both fighters trading shots, this is a war! Another big shot, and another! 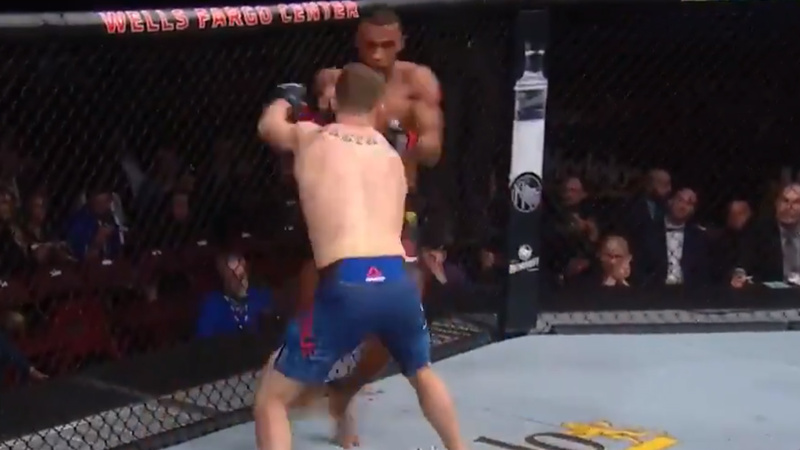 Low kick Justin Gaethje, Edson Barboza replies with a low kick too! Barboza tries to circle and goes to the fence, but a big right hand sends him to the canvas. A KO win for Justin Gaethje, what a fight!!! Justin Gaethje improves the score to 20-2 MMA, 3-2 UFC, Edson Barboza drops to 20-7 MMA, 14-7 UFC.